Of equal appeal to adults and three-year-olds, although not entirely for the same reasons. The gardens here are grade II* listed Link . "Enclosed by stone walls c 2m high, the Rill Garden was originally planned as a rose garden, but now (1998) contains four beds planted with semi-tender plants, together with tender shrubs and climbers on the walls. 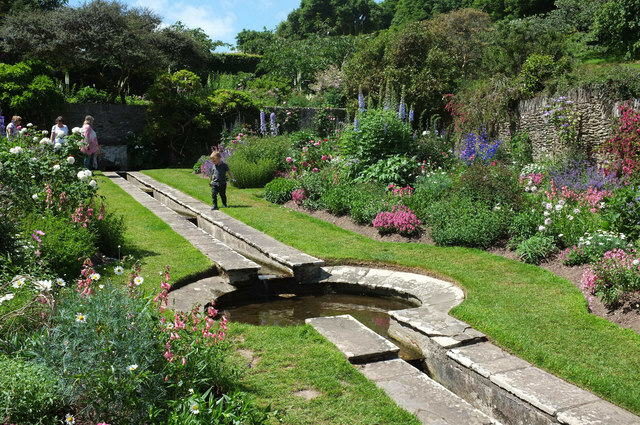 A canalised stream flows in a deep stone-kerbed channel from a cistern and pool at the north-west end of the garden, through a series of shallow cascades and a circular pool with a concave stone rim."